National Rally - 13th to 15th June 2015.
several quarries and underlying strata of coal. There are the remains of old coal pits. Across Baildon Moor is the village of Menston, the town of Ilkley and Ilkley Moor. Baildon is situated on a hill to the north of the River Aire and the Leeds and Liverpool Canal. is said to have preached from the arched window of a building on Browgate. The site is:- Baildon Rugby and Cricket Club, Jenny Lane, Baildon, West Yorkshire, BD17 6RS. The site will be open from Thursday evening for early arrivals. There is a good chippie, a co-op supermarket, coffee shops, cafés and pubs all within a few hundred yards of the site. Breakfast will be available on Saturday and Sunday mornings on the site. There will be a buffet on Saturday evening. Rally fee is £15 per person for the weekend, to include camping fees, badge and buffet. Under 16s free (no badge). There will be a choice of runs on the Saturday and shorter runs on Sunday. No Pre-booking. No camping Sunday night. This will be held on the Sunday morning of the rally. There are no proposals from members, so it will be a quick meeting to receive brief reports from club officers, including the financial report, and to elect the Committee. 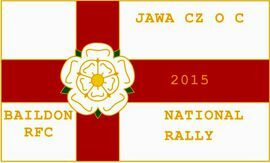 There will be news about the 2016 National Rally arrangements and there will be a chance for members to raise any matters for discussion. Do come along and show support for the people who work so hard to keep the Club active and interesting. Please make the effort and attend our National Rally. It is a once a year opportunity for us all to meet up with old friends and make new friends, have a chance to see and share our love for all things Jawa and CZ. We will have the option to take some time out from enjoying ourselves, to attend the all important AGM. If you can't make it on your bike, do come by car, camper-van, bicycle or on foot, but DO come along. As always at our events, members’ friends, partners, children, grand-children, are more than welcome to come along.